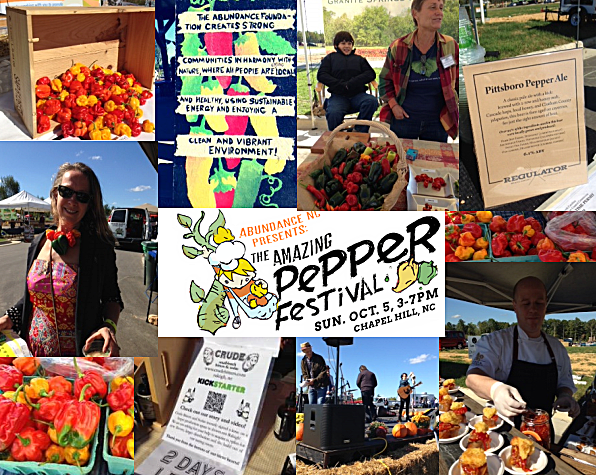 I was very excited when I found the advertisements for the Pepper Festival and the Abundance Foundation. I was expecting the similar type of food that I had when I attended a pepper event in Texas. I arrived at the festival at 2:30 so I could speak with vendors and take pictures, since it was scheduled to start at 3pm. Unfortunately, no one was set up by 3pm, let alone by 2:30. It was a Sunday, so I suppose everyone was running behind. I tried not to let it bother me, since the day was sunny and bright, there was plenty of good food and drink and music playing. What more could anyone ask for? The food prepared by the chefs was being judged. I am not sure what directions had been given, but most chef’s prepared similar items, either polenta or cornbread topped with meat and hot sauce, relish or pepper jelly. I had expected to have more variety. There was one booth that had jalapeño hot chocolate, but when I arrived at nearly 3:30 to the booth, I was told it would be another 20 minutes before it was ready. TOPO distillery had some interesting drinks. I had to limit them to a sip, since I was driving. TOPO is quite popular in the triangle region. I had the opportunity to speak with the employees at the pepper festival and they were all very charming and accommodating. Jordan, allowed me to step behind the table so I could get better pictures of their fabulous salsas and dips. I also tasted the Pittsboro Pepper Ale by Regulator, who won first place. It started off mild with and ended with a spicy kick, with subtle flavoring of hops and honey. It would be great with a spicy bloody Mary mix. They were still working on their Kick Starter and I saw that they reached their goal last night. They were very excited about their pepper beer and it was popular since there was a line waiting to sample it. Congratulations Regulator! Fearrington Granary, TOPO, Top of the Hill, Tribeca Tavern, Lilly Den Farm, Crude Bitters and Sodas, Angelina’s Kitchen, Cottage Lane Kitchen, Larry’s Veggie Bus, La Residence, and Central Carolina Community College Hospitality and Culinary Arts were all sampled. My favorite was the Chili Nacho by Angelina’s kitchen who won first prize. There was a sole food truck called Small Potatoes Mobile Kitchen, but I was too full to sample their food. Maybe next time, but one person can eat only so much. I had the opportunity to meet the WRAL DJ’s and played a game of PLINKO. I love reading their site for things that are available to do in the Triangle area. Keep up the great work. I was also told about a farmers market, that all produce is locally produced, called the Western Wake Farmer’s Market. I was told that I had to go see what they had to offer. I plan on going back next year for the Pepper Festival, because I think it will get better and more organized. And hope that someone will make an awesome hot dish. The Traveler.